Did you know that Marin ranks right behind LA and NY in homelessness? The IJ interviewed some WPC members on how we can fix this. WPC got a "shout out" at the Health Datapalooza in Washington on our use of data on social determinants of health to improve care for our most vulnerable clients. 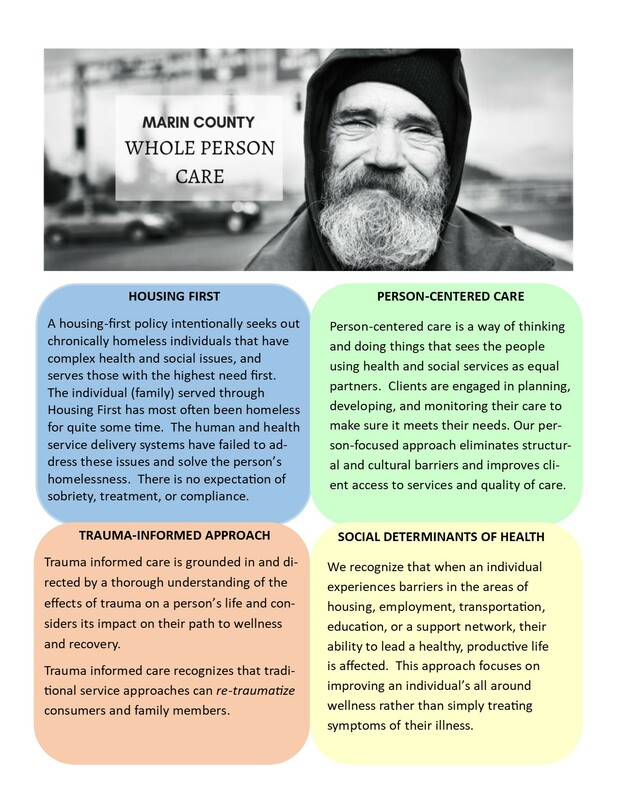 Whole Person Care is an important part of the County’s homeless system of care: check out our new Housing First website for more information on Marin County’s response to homelessness! In June 2017, Marin County Department of Health & Human Services (Marin HHS) received approval from the state to begin implementation of the Whole Person Care 1115 Waiver. 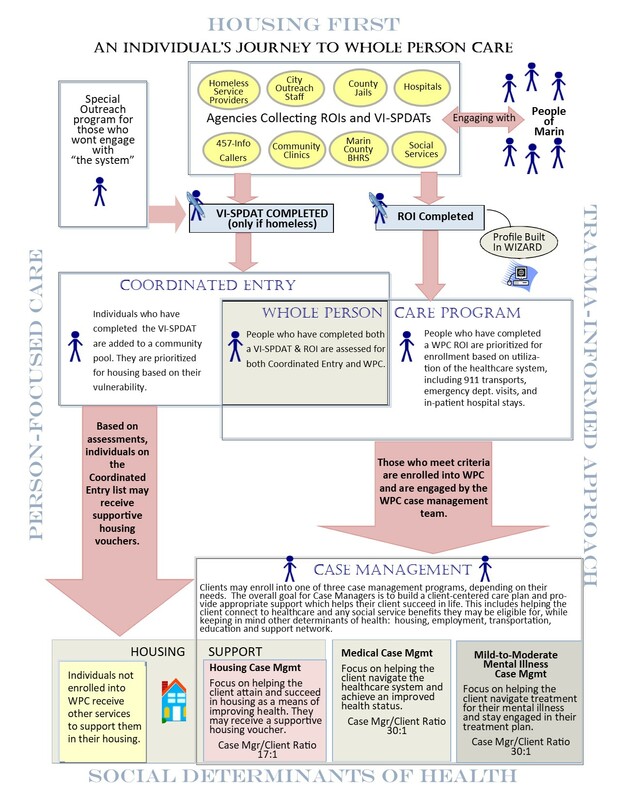 The vision of the County of Marin’s Whole Person Care Pilot (WPC) is to build a sustainable, evidence-based, outcomes-focused coordinated system of care across health and social sectors to more efficiently and effectively serve Marin County’s most vulnerable Medi-Cal beneficiaries. 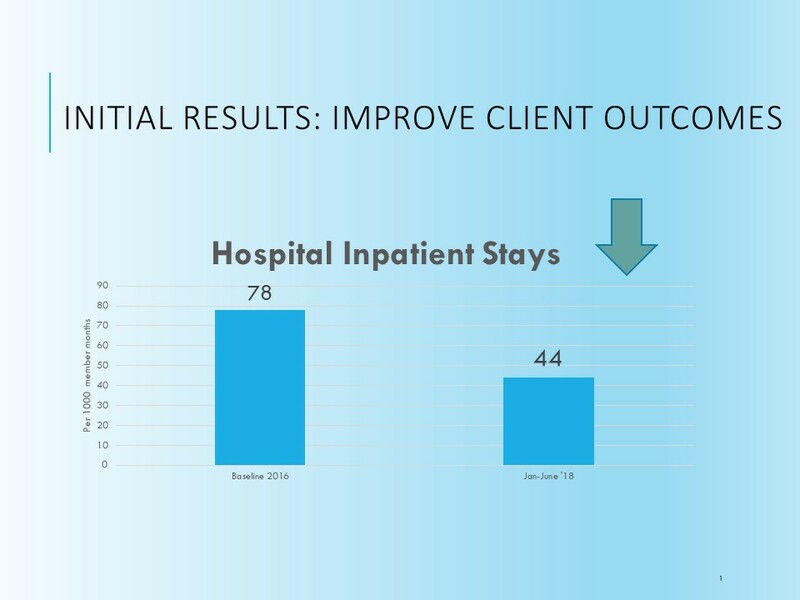 The WPC pilot is building upon existing programs and services by implementing a unified, coordinated entry and care management system; by standardizing screening, assessments, and care coordination; and, by promoting bi-directional information sharing and care coordination among providers. The goal for this systems-level change is new, coordinated, and sustainable approaches to meeting the needs of high-risk, high-cost Medi-Cal beneficiaries. Individuals on Medi-Cal who experience complex medical conditions, behavioral health issues, and/or lack social supports that interfere with standards of care and result in high utilization and costs, with particular focus on individuals who experience homelessness or are precariously housed. These preliminary results are encouraging. 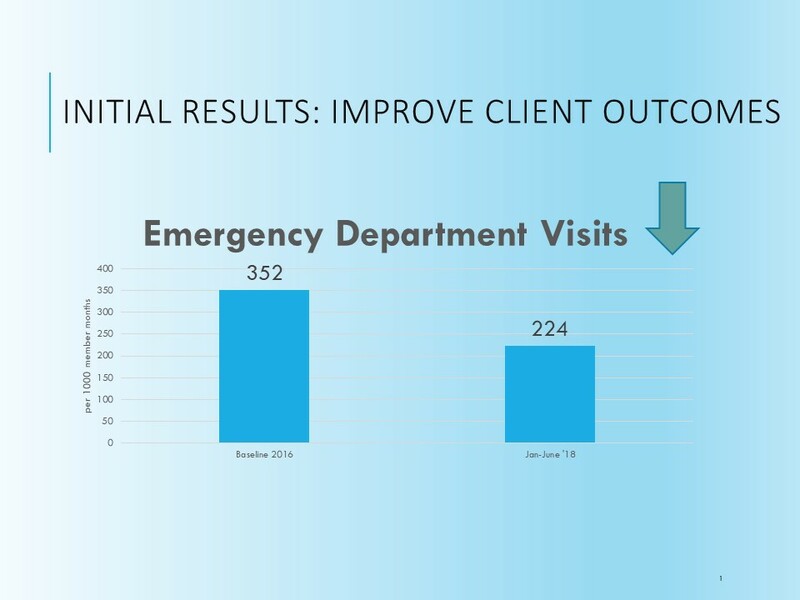 We will continue to monitor results as the program matures and enrolls additional clients. Download a PDF of the list of Participating Entities. Vogel, D. P. (1993). Patient-focused care. American Journal of Hospital Pharmacy, 50, 2321-2329. Access at Patient-focused care.